My last post was my announcement of the Ravelry 2014 Indie Design Gift-A Long. The promotion began in mid-November with a nine-day 25% discount on 3822 independent designer knit and crochet patterns. The promotion continues to the very end of December... There is a whole lot of fun to be had!... There are many games and contests with thousands of prizes! 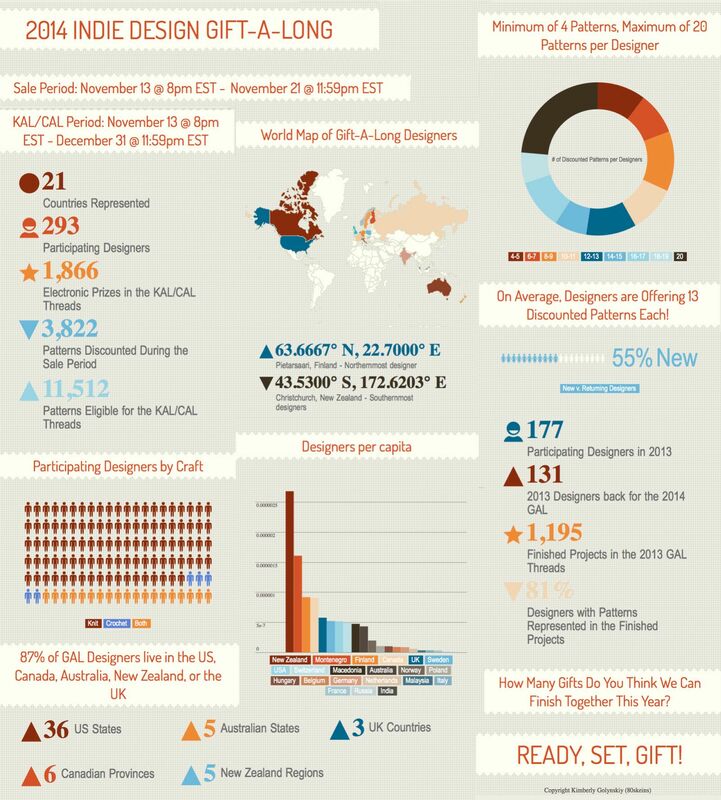 11,512 patterns are eligible for everyone to use for the ongoing Gift-A-Long KAL/CAL. You become eligible to play and win in the games (like Name That Designer) just by entering the KAL/CAL! See the Ravelry Indie Design Gift-A-Long group rules thread for all the details. I am blown away by all of the work that has been done by those who have organized this event. Shown above are some statistics (larger image: http://i.imgur.com/QG9WVZs.jpg) that were compiled and graphed by a Raveler named 80skeins. That last link is to her designer page on Ravelry, but if you have time you should take a look at her Worldwide Blog Tour: AroundtheWorldin80skeins. She has already interviewed and posted about indie designers in 25 countries. The posts are very interesting and the photographs are amazing! I am thankful for the Group Administrators/Organizers, alextinsley, KnitEcoChic, ninaknits and Simone77. These links are also to their designer pages. If you like Pinterest, check out this page with links to GAL 2014 Pinterest Boards. This has been a wonderful time to get to know many great designers and their work!